I love eating at Annie’s Burger Shack, they really do have some of the best most authentic US style hamburgers that you can find in the city and probably in the UK as well. I have been here a few times now over the years and I have slowly worked my way through the menu ticking off many of their burgers one by one. I have sampled their excellent “Classic” burger which is your basic diner style cheeseburger, their ‘Mushroom Swiss’ (one of my all time favourite burger topping combinations), and their ‘Bacon Cheddar’ burger. Today though it was time to start getting a little more adventurous and take a punt on one of their more exotic offerings. I had spent a little time checking out the menu online before this visit, and had set my mind on sampling the “Kogumaza” burger. 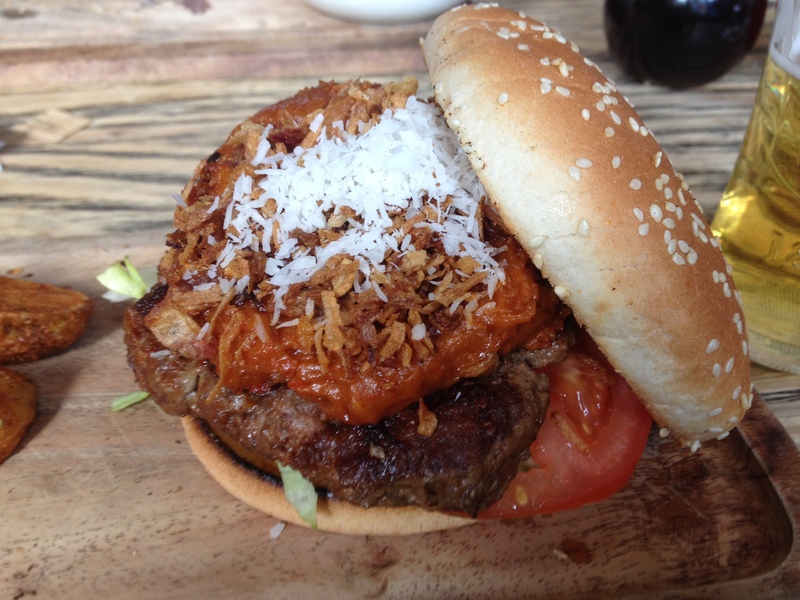 This is a beef burger topped with a ‘homemade Dutch Indonesian peanut satay sauce, with crunchy onions, a pinch of coconut, and fresh coriander’. It was quite a departure from my normal kind of choice, but it was a deviation that was well worth taking, sometimes you have to travel the road less travelled just to see what is out there. In the end this topping was not as ‘out there’ as one might think, I will be honest and say that I still prefer my classic cheeseburger, but this did pique the interests of my taste buds. It was a little bit spicy and a little bit sweet, just like getting a satay in a thai restaurant, I think that it would have worked better within a chicken sandwich, but it is still good on the beef. I would have liked more coriander and less coconut, but that is just nit picking. The other warning I have to add is that this is a really messy sandwich and I did end up with ‘peanut butter’ sauce all over my chin and fingers. It was well worth the mess though and I would heartily recommend trying this combination. One of the problems with Annie’s is that once you have eaten your own burger, your eyes start to wander away to the plates of other diners, just to see what burger toppings they have gone for. Your stomach knows that you have no chance of being able to eat another mouthful, but no-one seems to have told your head. This was the case today, as I cast my eyes across my fellow diners dishes, alighting first on one of the “Lemmy” burgers. This looked quite pretty on the plate with the mustard or was it cheese? oozing out slightly from that seeded bun. The Lemmy burger is described on the menu as a “Burger topped with melted cheese, tons o’ grilled jalapenos peppers and their own ‘Jack Daniels’ mustard sauce” Mmm interesting, what else is there on this table to drool over? The next “beast” of a burger that I spotted was the “Navigation Blues” burger, I am not sure quite how aptly this one was named? judging from what I could see “Navigation Meat Feast” might have been more appropriate. 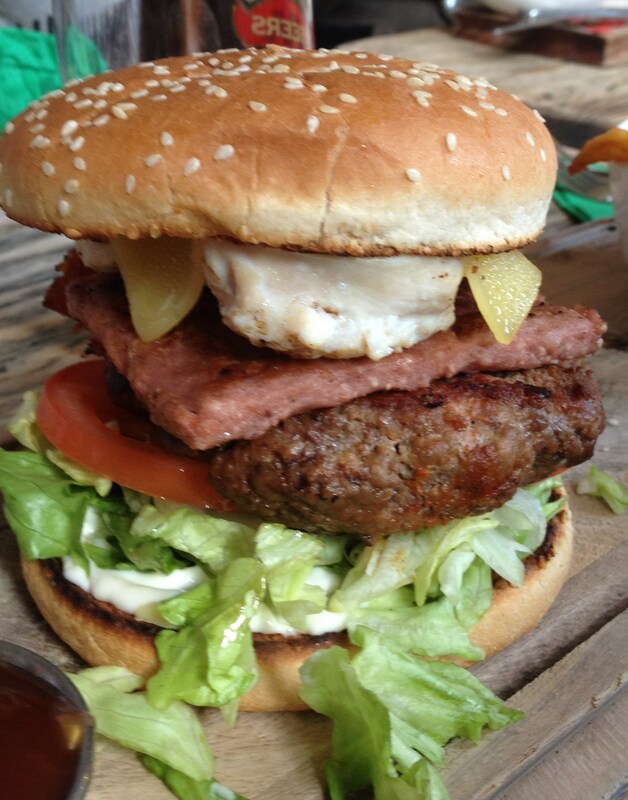 It is a huge beef burger topped with a grilled sausage patty, a piece of grilled chicken, and a slice of bacon! add to that some cheddar, and the usual dollop of mayo, salad toppings and you will find yourself staring down on one huge behemoth of a sandwich. The kicker with this particular burger that allows you to customize your experience is the choice of mayo, classic American style or you can take it up a notch with chilli garlic or even some horseradish. I might be tempted into having this burger topping next time I visit. The burgers at Annie’s Burger Shack are the sort of sandwich that brightens up your day, a little bit of sunshine and magic in a bun. I already knew that, and I guess you probably know that too, but sometimes you just have to say it as well. I really need to come here more often, but perhaps that would make each visit a little less special and less of an event? Oh who cares I am coming back next week as well! 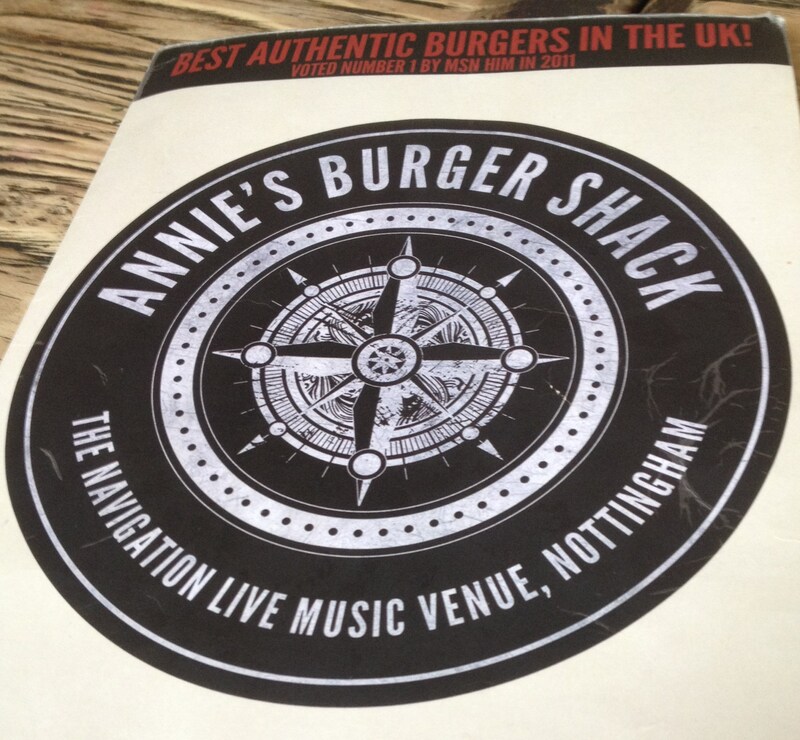 Annie’s Burger Shack is located in the Navigation Inn at 6 Wilford Street in Nottingham, and is open 12-8pm Monday to Saturday, and 12-6pm on Sundays. If you go on Sunday then I suppose that you really should try the “Sunday Dinner” burger topped with roast chicken, roast potatoes, Yorkshire pudding, stuffing, and veg covered in gravy? I really want to see someone having that!